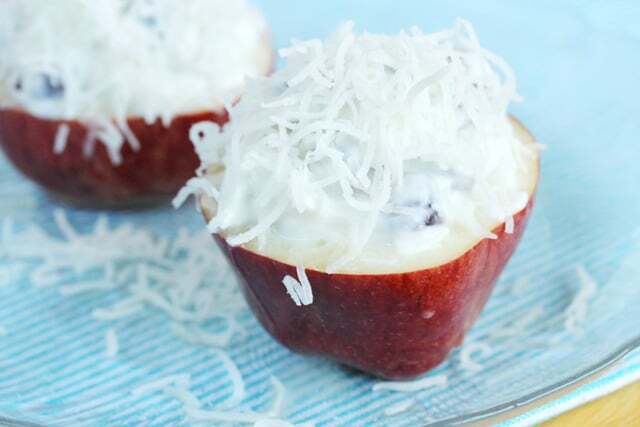 Enjoy these “faux cupcakes” for breakfast or a snack. You know how there are some foods that just taste good together? 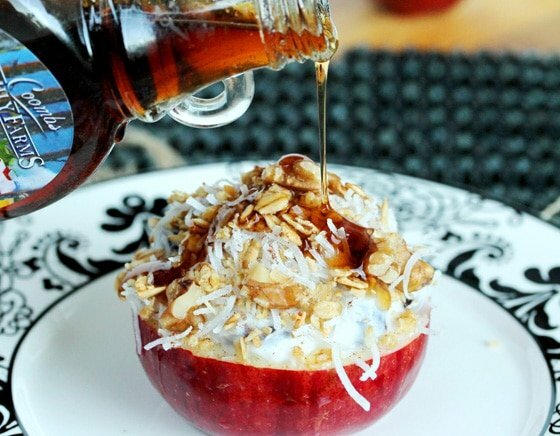 Or even apples and granola. 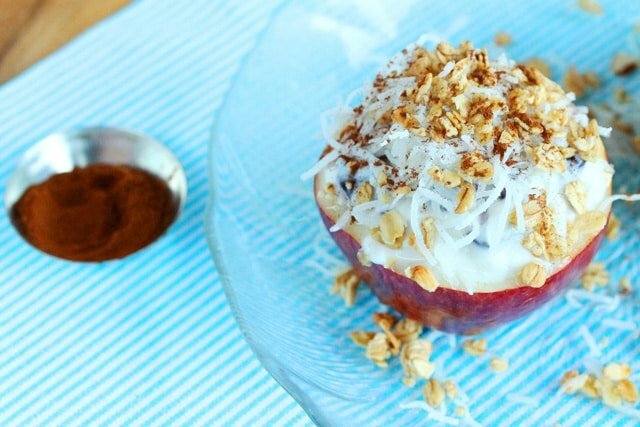 Oh sure, you can cut up the apples and eat these delicious ingredients mixed up in a bowl. But if you’re feeling more fancy than that, check out how fun and easy it is to make these “faux cupcakes”. 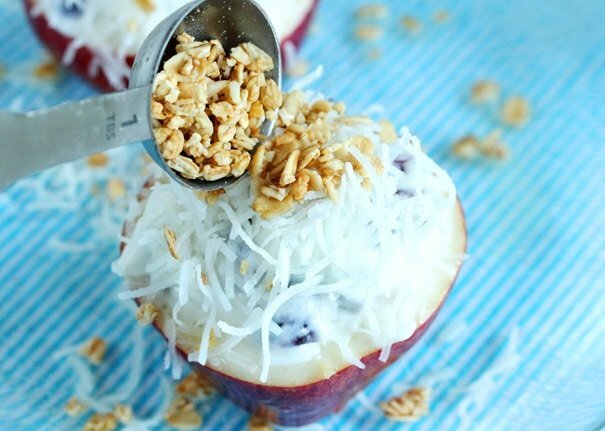 If you like coconut, you’ll have to give these yummies a try. The combination of flavors and textures taste really good together. 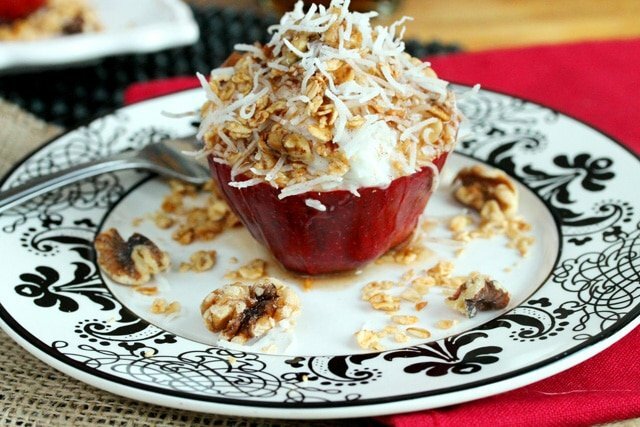 And to be honest, it’s kind of fun to eat these apple cups because they’re a little bit messy, especially with maple syrup drizzled on top. 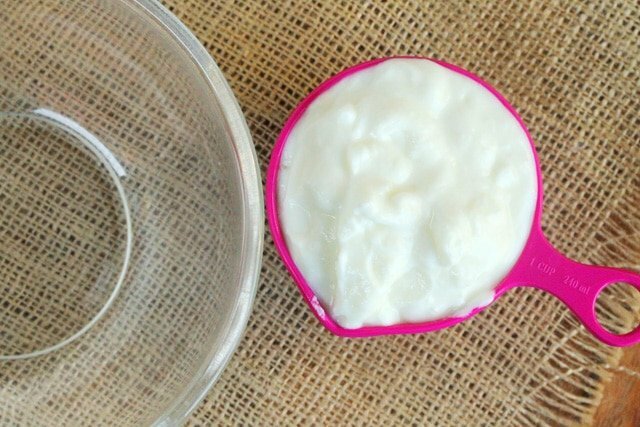 You can even pretend you’re eating the frosting off of a cupcake when you’re really eating yogurt. 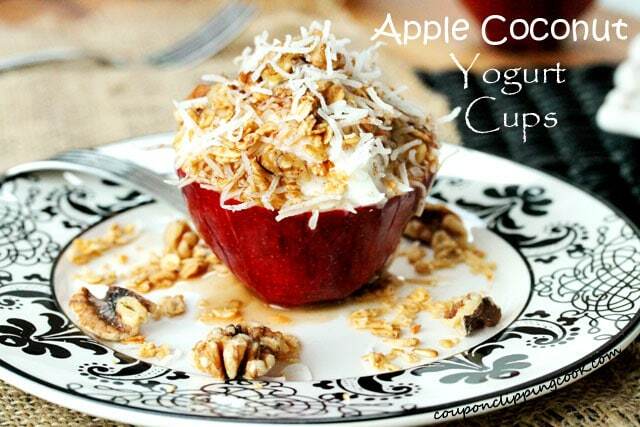 These apple cups make a wonderful breakfast or snack. 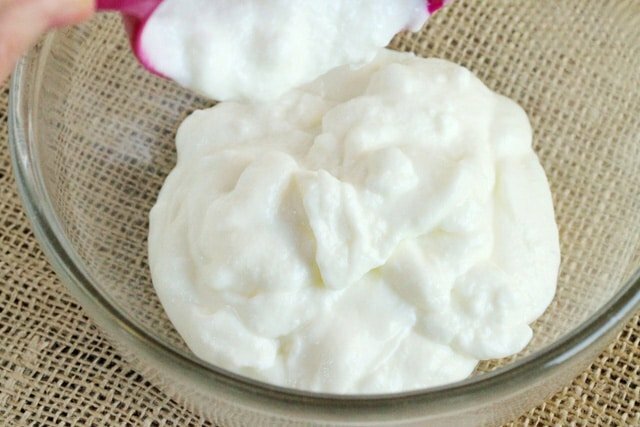 Here are more recipes made with apples you may like “Heart Apple Pie Galette with Streusel“, “Apple and Mint Limeade Smoothie” and “Sliced Ham, Apple and Blue Cheese Wrap“. …cover with plastic wrap and put in the refrigerator while preparing the apples. 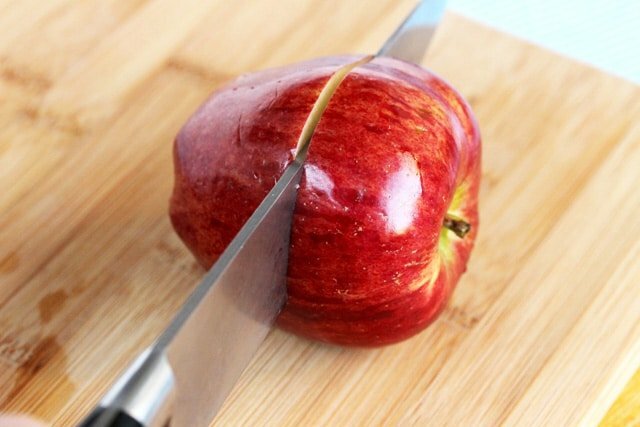 Cut the apples in half width-wise. 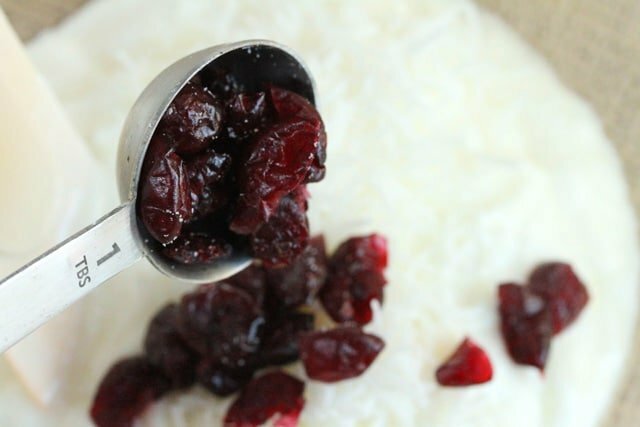 Using a small spoon (or a ¼ size teaspoon), scoop out the core and seeds. Scoop out a section of the apple that’s a bit larger than the diameter of the core (about two inches diameter). 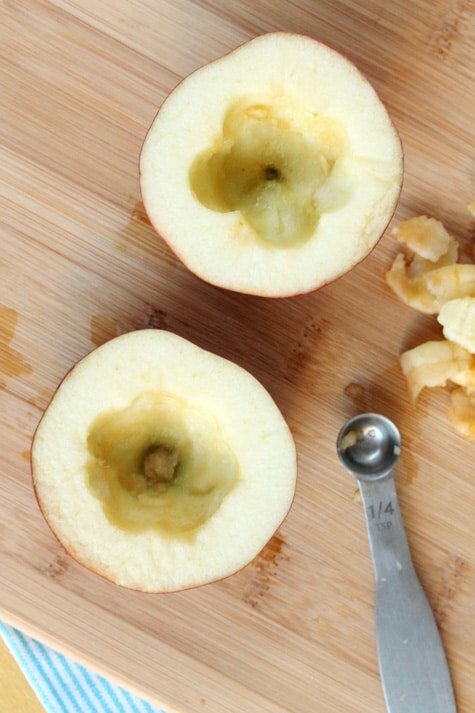 TIP – If you happen to scoop out too much of the apple at the bottom and you see a small whole, just take some of the apple that you removed and put it back into the bottom of the apple to cover the space. 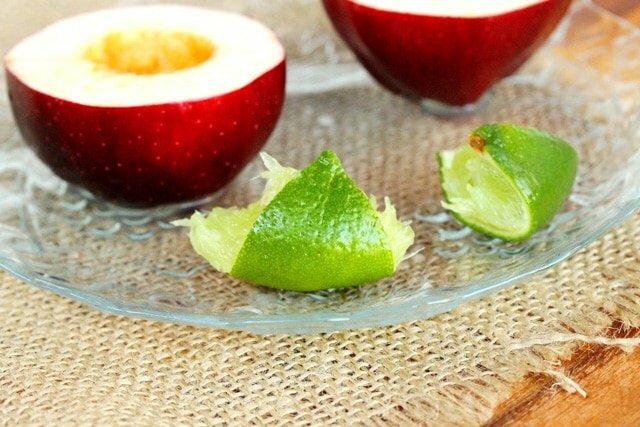 The lime juice should help prevent the apple from turning brown. 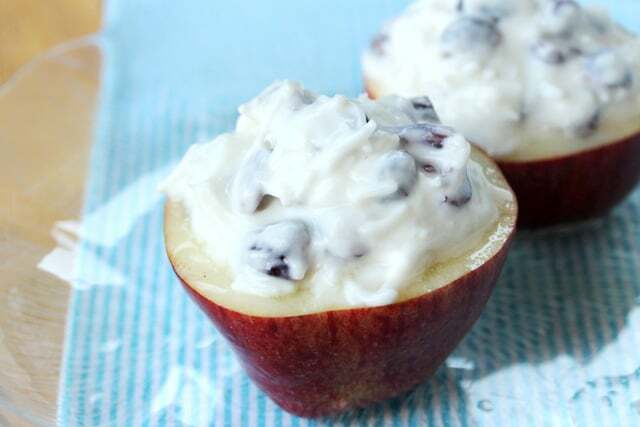 Filling the Apple Cups – Stir the yogurt filling again and add it in the cavity of each apple. Also add the filling to the top of the apple so it resembles frosting on a cupcake. 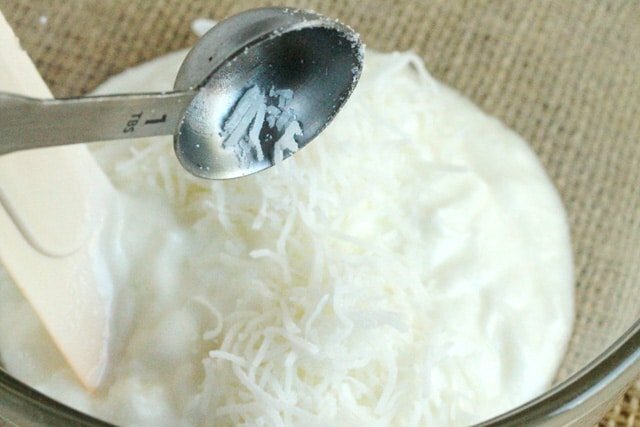 Sprinkle the remaining shredded coconut on top of the yogurt filling. Then sprinkle cinnamon on top. Just before serving, drizzle maple syrup on top. 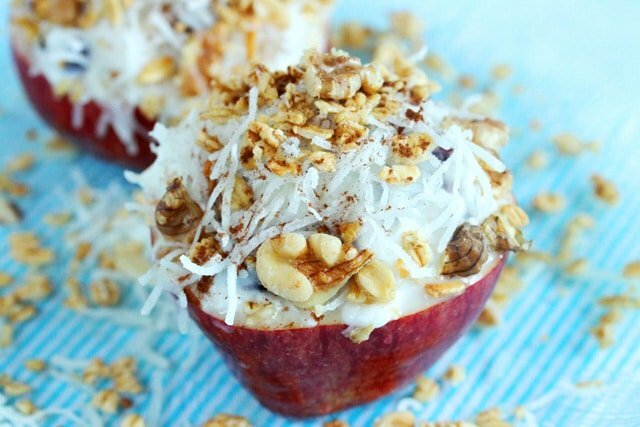 Enjoy these "faux cupcakes" for breakfast or a snack. 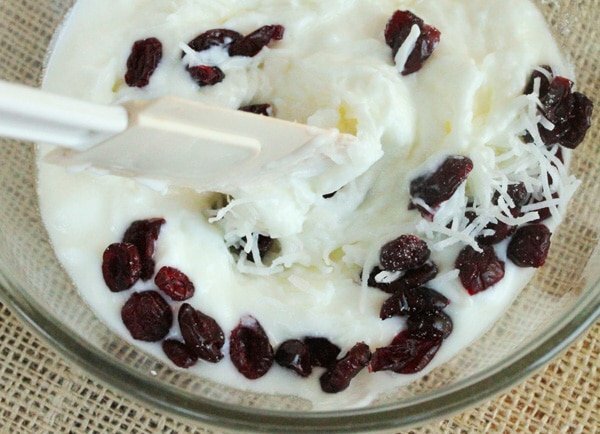 For the Filling - In a medium size bowl, add yogurt, shredded coconut, and dried cranberries. 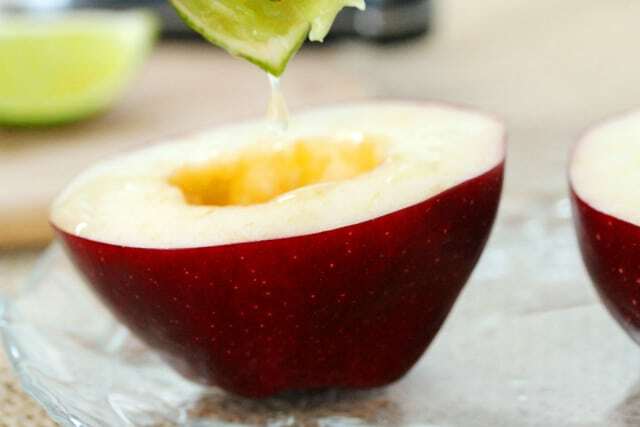 Mix together, cover with plastic wrap and put in the refrigerator while preparing the apples. 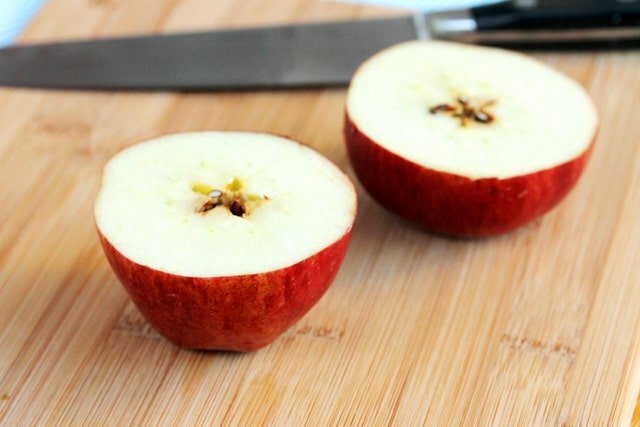 For the Apple Cups - Cut the apples in half width-wise. 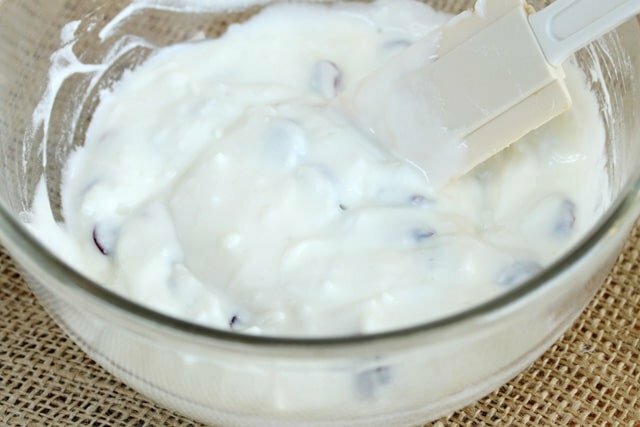 Using a small spoon (or a ¼ size teaspoon), scoop out the core and seeds. Scoop out a section of the apple that’s a bit larger than the diameter of the core (about two inches diameter). Set aside for a moment. 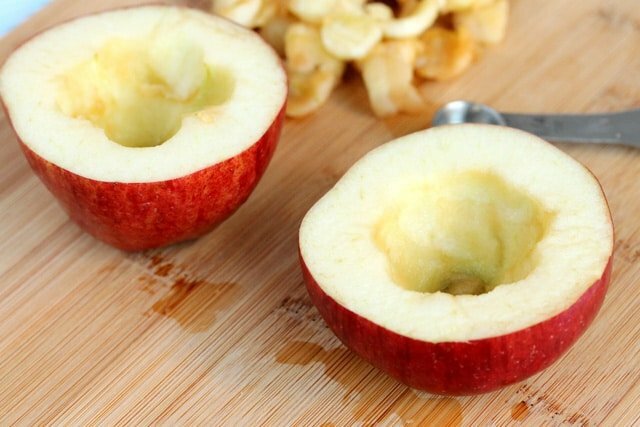 If you happen to scoop out too much of the apple at the bottom and you see a small whole, just take some of the apple that you removed and put it back into the bottom of the apple to cover the space. 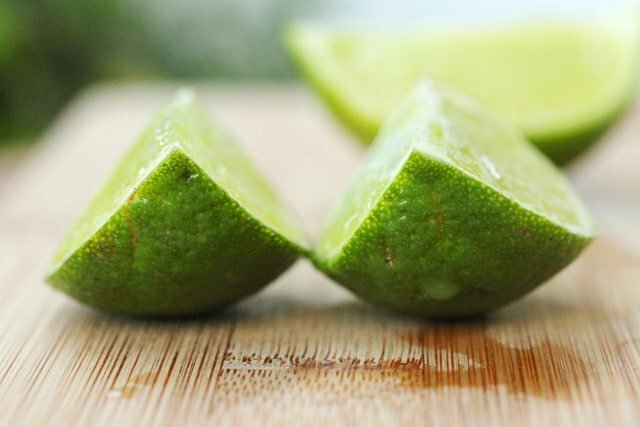 Squeeze lime juice from each quarter of lime over the flesh and center of each apple (this should help prevent the cut area of the apple from turning brown). Filling the Apple Cups - Stir the yogurt filling again and add it in the cavity of each apple. 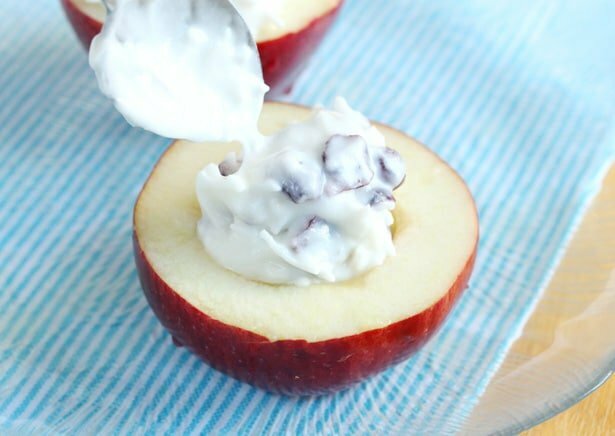 Also add the filling to the top of the apple so it resembles frosting on a cupcake. Then sprinkle cinnamon on top. Next, top with granola and walnut pieces. 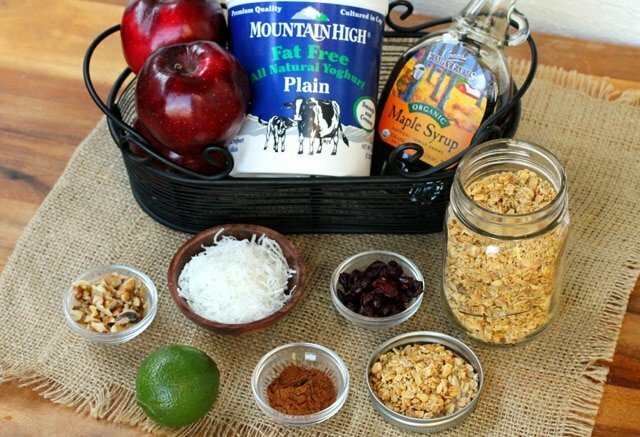 These sound like such a festive dessert tray idea–thanks for sharing a great idea! 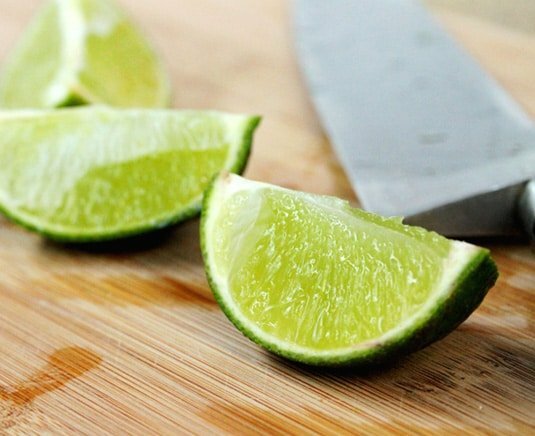 I’m a born&bred apple adorer, and a converted coconut lover, so I can’t wait to try these for a quiet fancy night at home. Cheers! Hi Ala, so glad you like it. Thank you for stopping by! Hi Katie, thank you very much. I don’t know why but it’s so fun to eat. Have a great weekend!